We really love the style and overall look of the 8′ x 8′ Traditional Heavy Apex Shed. 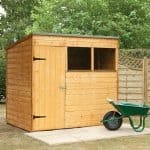 The fact that this is a compact sized shed means it is something which can be used in pretty much any size of garden so those of you with gardens that are on the small size will love this. It will provide you with that extra storage space you need in order to keep a number of things safe and also organised. While clearly a very practical shed it is also something that is going to look fantastic in your garden. Those three windows and that good sized door give the shed a whole lot of personality. Treetops Traditional are very well known for making sheds that are top quality and the quality of this shed is certainly very high from top to bottom. There is a high apex roof to keep the water out and this along with the tongue and groove shiplap cladding do make this a very attractive, but strong shed. Speaking of strong there is an incredibly 44 mm x 44 mm frame keeping everything securely together. It does not stop there though as the floor is just as strong as the rest of the shed and made with tongue and groove boarding. Treetops Traditional have been really impressing us as of late with their fantastic line of sheds and today we are looking at one of their more compact and stylish sheds the, 8′ x 8′ Traditional Heavy Apex Shed. 8 feet of width and depth does not sound like a great deal of space, but what you have to remember is that you are in control of how you store things. So if you just open the door and toss things inside then that space is going to fill up pretty quick, but with some careful planning and really utilising the space you have then 8 x 8 is more than big enough for most people. Also helping you out in the storage department is the height of the shed as along the ridge it is 8 feet 1 inch and at the sides the shed is, 5 feet 9 inches where you can put some shelving and really make that space go far. The apex roof has been made very well and thanks to those 12 mm tongue and groove boards if we do get unlucky and old man winter gives us a lot of snow then these boards will happily be able to handle all that weight. Even your neighbours overweight cat can stroll along this roof and it will have no effect. Keeping the boards water free is some very heavy duty felt that also has a pretty smart look to it. With a thickness of 12 mm the tongue and groove shiplap cladding is every bit as robust as it is nice to look at. The redwood which Treetops Traditional use for their sheds has such a nice and sleek look to it and we are sure that it is also has a very smooth feel as well. This style of cladding has been chosen because it keeps the rain out incredibly well. There literally is no little nooks or crannies for rain to get into the shed. For such a compact shed this does have one very tough frame backing it up. At 44 mm x 44 mm this is a frame that is not going to become weak after a few years. Actually we firmly believe that 20 years from now this frame will be just as sturdy as the day it was made. One thing that Treetops Traditional always do with their frames is round the edges to help make it even stronger. One very smart design choice of this shed was using those same 12 mm tongue and groove boards which are used for the roof, for the floor. This gives you a very sturdy and strong floor which can handle a whole lot of weight so for those of you who have a lot of heavy items such as tools and gardening equipment, this floor is going to be very good for you. That smooth redwood will be given a free basecoat treatment which is fine, but you will need to give it another more thorough coat yourself, shortly after construction. Once a year a fresh coating should be applied to keep the wood strong and to prevent it from rotting. While we would like Treetops Traditional to give as long a guarantee as some of the other manufactures do, we do feel that their year long guarantee is more than enough as the shed is made so well. 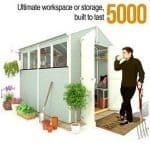 While the shed in the picture has a double door we must tell you this is an extra that will cost you an additional, £56.99. Do not worry as the standard door is still great at, 2 feet 6 inches wide and 5 feet 9 inches high. Three high quality hinges will be used to keep the door in its place. One thing that you can change about the door is its style. If you would like, you can request the door be changed to a stable style door. The shed comes with three glass windows. This is not cheap glass either, it is tough, horticultural glass than is going to be able to take a little bit of abuse which is perfect if you have kids as one of the laws of physics is that if a kid is playing with a ball it will hit the shed window. Two of these windows are fixed, but one does open, we just love the style of these windows with their cross design on the frame. If you would like another window can be upgraded so that it can also open this will cost you an extra, £31.99. To be honest with this being a more compact sized shed, one window being able to be opened is more than enough. With the door having a lock and also being held in place with three strong hinges, the 8′ x 8′ Traditional Heavy Apex Shed is one very secure structure that we do not see you having any security concerns over. Adding an extra security measure like a pad bolt or padlock would be something that is easy to do and also cheap. With there only being three windows, three very nice windows we might add. Privacy is not really an issue with this shed and if it is there are a few things you can do about it. First of all cover the windows with a set of curtains or even just a piece of fabric. Or if you want complete privacy then ask for the shed to be fully boarded and this way there are no windows at all. We already mentioned how you can change the door, but when you are building the shed you can choose which side the windows will go on. As well as this you can make the shed a little brighter or perhaps a darker shade with some coloured wood treatment. While you can pay to upgrade the door and the windows there are a couple of other things you can add to this shed. If you are building this on grass and want to raise the shed off the floor a little bit then they do have a set of wooden floor bearers which can be purchased for what we consider to be a very reasonable, £34.99. 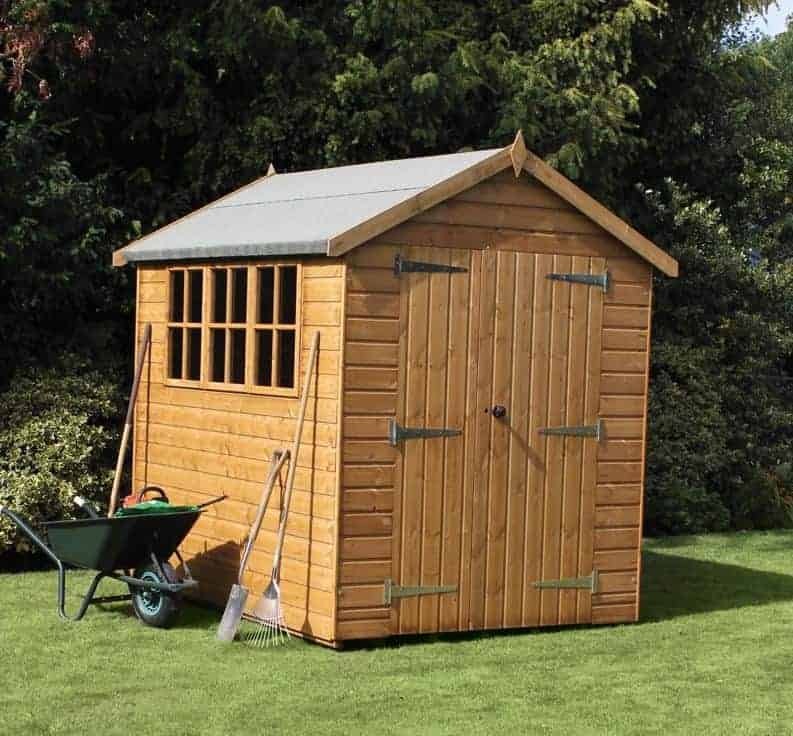 For £134.99, you can have the shed installed for you when it is delivered which can save you time and also your thumbs from being bashed with a hammer when you try to do it yourself. The compact design of this shed just highlights how high quality work, Treetops Traditional do. We honestly are very impressed with what they have done here. You are going to get 20 or more years out of this shed, we are very confident about that. A huge plus of this is that you only have to give it a fresh coat of wood treatment once a year and that is all you really need to do to maintain it. While a little small for some, for the average family or just a person needing a place to keep things safe and organised it is an ideal size. This is not going to cause you any headaches during installation. You will need a person to help, but it should take you 3-5 hours at the most. 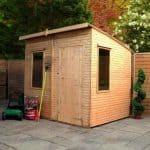 This is a shed that we really do like and if you want a smaller shed, but one that is of very high quality then you will find this to be excellent value for money. Final Thoughts: The 8' x 8' Traditional Heavy Apex Shed is something that we really do like. 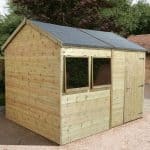 At first we were a little unsure of the price, given its somewhat small stature, but this shed is made with just such incredibly high quality materials that the price really is quite fair. 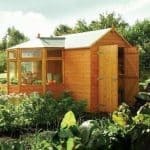 The shed has a lovely look to it so it is going to be something that really stands out in a positive way in your garden, plus despite being a shed that is going to last many years it really does not require a whole lot of maintenance from you. 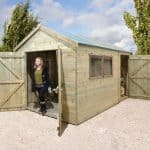 If you want a shed that offers you some cool style as well as storage space, then we think this is one well worth saving up the extra money for.